'This novel is a brilliant, beautiful debut. Reading it will change your heart' Christian Kiefer, author of PhantomsThe Long Way to a Small, Angry Planet meets The 100 in this unforgettable debut by a brilliant new voice. * A century ago, scientists theorised that a habitable planet existed in a nearby solar system. Today, ten astronauts will leave a dying Earth to find it. Four are decorated veterans of the 20th century's space-race. And six are teenagers, graduates of the exclusive Dalton Academy, who've been in training for this mission for most of their lives. It will take the team twenty-three years to reach Terra-Two. Twenty-three years spent in close quarters. Twenty-three years with no one to rely on but each other. Twenty-three years with no rescue possible, should something go wrong. And something always goes wrong. Don't miss one of Cosmopolitans books by people of colour to get excited about in 2019, called 'a tightly wound epic' that 'will change your heart' by Christian Kiefer, author of Phantoms. *WHY READERS DREAM OF TERRA-TWO . . . 'An ambitious 500-page coming-of-age blockbuster . . .Oh is excellent at portraying the aching sense of loss on a one-way trip to the stars' Guardian 'A tightly wound, emotional epic that asks important questions about humanity, goodness, belief, technology, love, friendship, and duty. At what point is grabbing hold of one's destiny ultimately an attempt to escape some other? Like all great writers, Temi Oh refuses the easy answer, instead ruminating upon the question itself. This novel is a brilliant, beautiful debut. Reading it will change your heart.' Christian Kiefer, author of Phantoms 'One of the most absorbing books I have ever read' 'This book seemed to take over my life whilst I was reading it - if I wasn't actually reading, I was thinking about it' 'I'm in love with this book . . . It is a beautiful, sprawling, literary delight with an unforgettable cast undertaking an unforgettable journey.' 'For fans of the character-driven The Long Way to a Small, Angry Planet series, Terra-Two is perfect . . . A strong, haunting, character-driven story . . . This book and its characters will stay with you for a long time.' 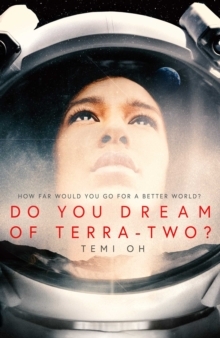 'Do You Dream of Terra-Two succeeds both as a great sci-fi story and a brilliant drama . . . Even though you expect things to go wrong in this story, they still wrong foot you when they do. 5*. 'Beautifully written . . . It's inspirational to read' 'I would love to be able to write like Temi Oh.